I always wanted to study in Europe. When my search began, and I was looking for English-speaking countries across the continent, I got to know more about Ireland. The opportunities the country offers amazed me and I have found it to be the safest country with the friendliest people in the world! It provides one of the top education systems in the world and offers affordable accommodation. Among all the institutes of technology in Ireland, LyIT attracted me the most. Located in the north-west part of Ireland, it’s in countryside and offers the best education at the most affordable cost in country. What more you can ask for — studying in such a calm and peaceful city while abroad. Technology is changing every minute. I know from having an IT background that it is always important to upgrade your knowledge to the latest technologies. Having completed my bachelor’s in Engineering in Computer Science, I wanted to pursue my Master’s abroad. Some IT experts also stated that in the next few years, the size of analytics market would evolve to one-third of the global IT market. And so, I found the perfect catalyst for my pathway to building a bright career. Hence, I decided to go for it and opted into a one year Master’s degree in Big Data Analytics at LyIT. My life in LyIT as an international student is fantastic. It is such a student-friendly institute, providing one hundred percent assistance from the day you land in Ireland. I was overwhelmed with by the great staff and lecturers in the college, which support us at every step. The student union in LyIT is something which every student can rely upon, for any kind of help at any hour. It is a completely different experience from studying for my Masters; the teaching is balanced between theoretical and practical knowledge. The assessments are based on real-time practical projects rather than theoretical exams. I’ve found this helps me in strengthening my practical knowledge about the subject, and makes me ready for the industry. The study schedule is also not too hectic and we have time for activities outside of our studies. You don’t need to hunt too hard for one; the institute has numerous clubs and societies where you can enrol to make your student life more fun. Since LyIT has students from across the globe, it’s easy to get to know about different cultures and people. There is an international society which is one of my favourites — it familiarises you with Irish culture by taking you on free trips to different parts of Ireland as well as festivals and providing food. It is really a fun! LyIT also organises job fairs which provides employment opportunities. There are events like “Hackathons” which are organised every year on campus in collaboration with some industries, that help students to know about companies and their employees. By providing such amazing facilities, the institute was a runner up for the Institute of Technology of the Year 2018, which was ranked by The Sunday Times. 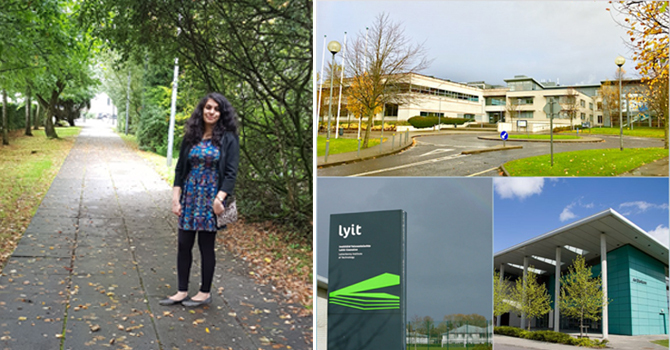 My time in LyIT is always one to cherish — It is my home away from home.